Party season is in full swing! That means you might be looking for a quick and easy holiday appetizers so you can spend more time mingling than in the kitchen. 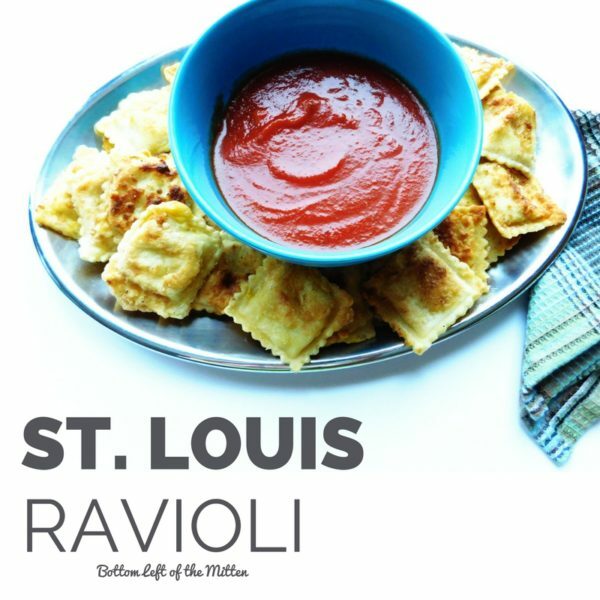 Toasted St. Louis Ravioli is the perfect holiday appetizer. I mean what’s not to love? 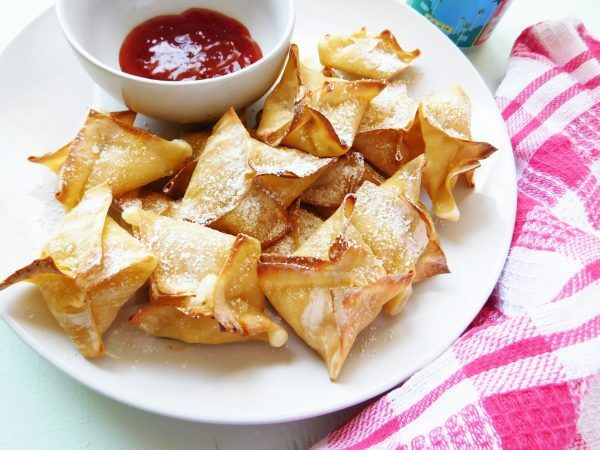 Cheese ravioli is dipped in egg, covered in a flour mixture then fried until golden brown. One creamy and crunchy bite will have guests asking for seconds. 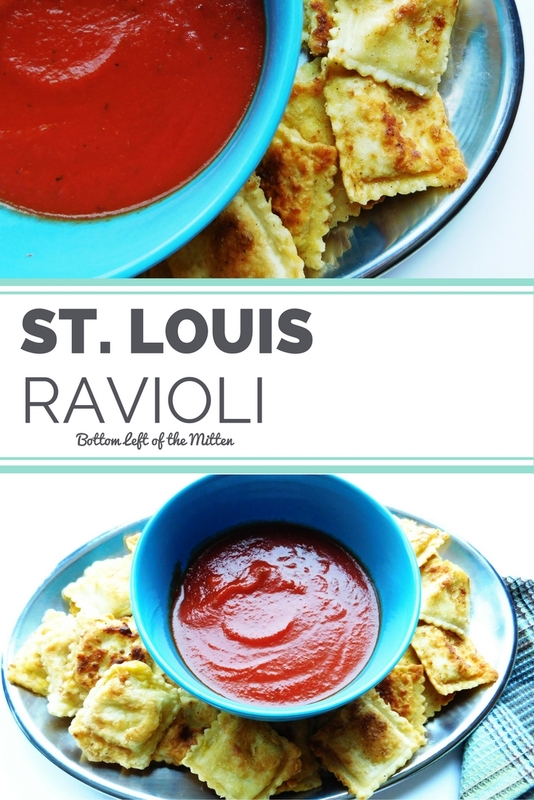 I have been making this ravioli for years. When we have a party at our house I always make this because it’s easy and simple. While it’s meant to be served hot, it really tastes just as good when it’s cold. On the rare occasion that we do have leftovers, I have found myself in front of the fridge late night snacking on the cold crunchy goodness dipping it into the equally cold spaghetti sauce. to throwing the Perfect Craft Beer Holiday Party! 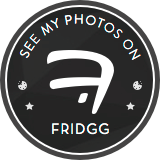 Come on….if your thinking I’m weird I know that you can think of people (or even yourself) that love cold pizza. Same difference?!?! 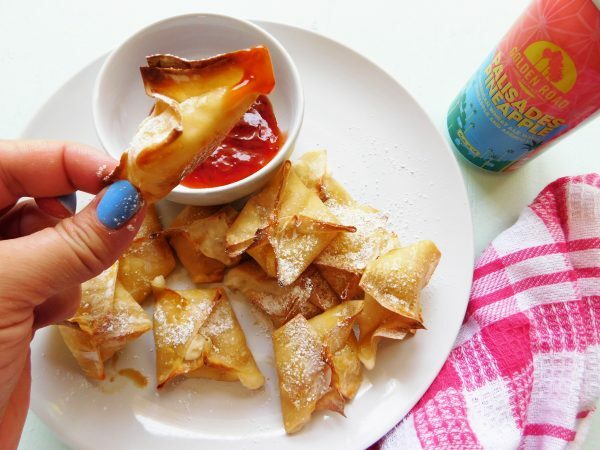 Ok, maybe not, but either way it’s great for a crowd or late night binge snacking while watching 30 Rock after your guests leave. First, take the bag of ravioli and cook it according to package directions. Drain and that is done. Set up an assembly line. Mix together the flour, Parmesan cheese, and garlic powder on a plate or in a shallow pan. In a separate bowl beat 2 eggs together. Add to a frying pan enough oil to cover the bottom generously-I used about 1/4 cups. Heat the oil over medium/high heat for 1-2 minutes. Dip ravioli into the eggs then the flour then add to the oil. Toast 2 minutes each side until it’s golden brown then remove and place onto a towel with a paper towel to drain. These ravioli will be worked in batches. After all the ravioli are done cooking, heat up a jar of spaghetti sauce for dipping. The oil can be checked if it’s ready for frying by lightly flicking a dash of flour into the pan-if it sizzles it’s ready. 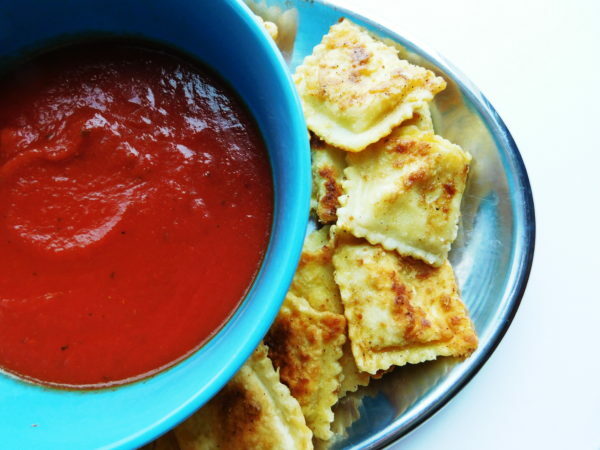 When about half of the ravioli are cooked the pan may need to be turned off and the oil discarded (please use caution and empty oil into a proper container) then add new oil since burnt flour bits get into the bottom of the pan during the frying process. From our home in the Bottom Left of the Mitten to yours ~ Happy Holidays! 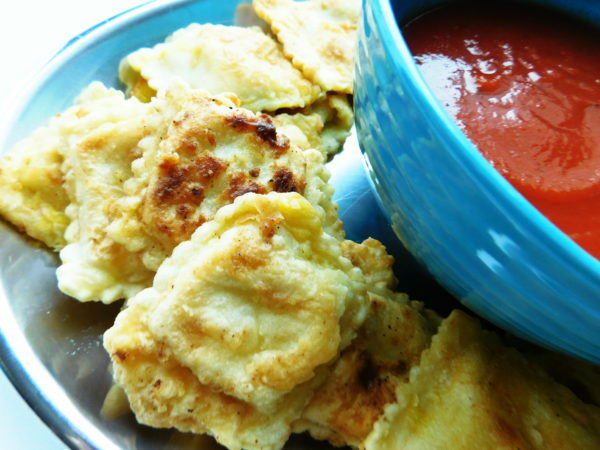 Cheese ravioli is dipped in egg, covered in a flour mixture then fried until golden brown. One creamy and crunchy bite will have guests asking for seconds. 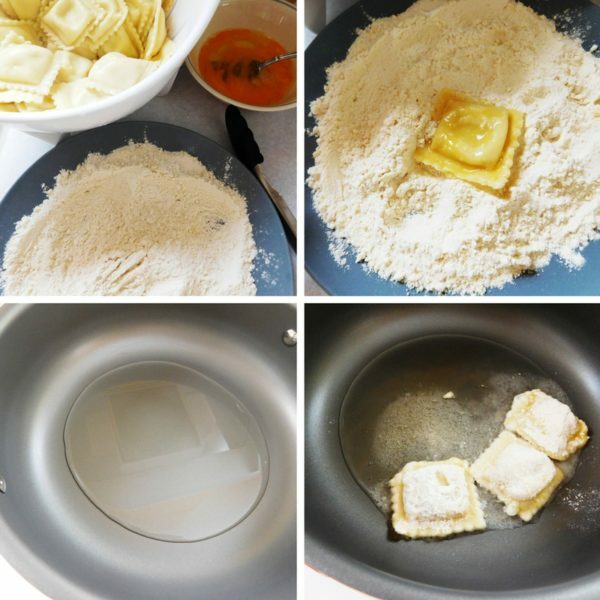 Take the bag of ravioli and cook it according to package directions. Drain and that is done. 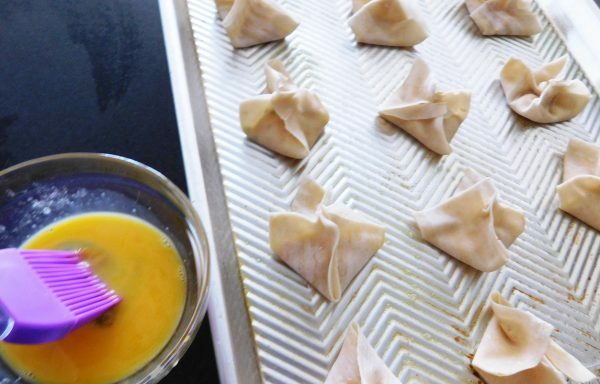 Dip ravioli into the eggs then the flour then add to the oil. Toast 2 minutes each side until it's golden brown then remove and place onto a towel with a paper towel to drain. Worked in batches. 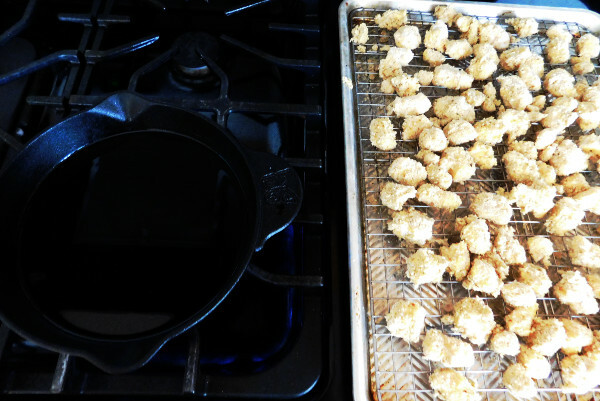 When about half of them are cooked the pan may need to be turned off and the oil discarded (please use caution and empty oil into a proper container) then add new oil since burnt flour bits get into the bottom of the pan during the frying process. After all the ravioli are done cooking heat up a jar of spaghetti sauce for dipping. Enjoy! The oil can be checked if it's ready for frying by lightly flicking a dash of flour into the pan-if it sizzles it's ready. Well, the Holiday Season is upon us. Whether I have to drag you kicking and screaming and inject you with season cheer. Or if you’ve had your finger on the Christmas tree lights while wearing your reindeer antlers. It’s here. Alas! Now me, I’m a holiday person. Pumpkin pie, dress the turkey, trim the tree, hang the stockings. Yes to all of it! But once the holiday is over-I’m over it. The next day: Tree-gone! Lights on the house-gone! Let’s not dwell and start thinking about the new year. But while it is here, I really do enjoy every moment of it. So this year one of the ways we’re going to enjoy it is by having some friends over for a Craft Beer Tasting Party! Santa likes craft beer as much as I do! Or I inadvertently placed that there. Usually when we have a party it’s BYOB and a dish to pass. Which is great as the host I only have to come up with one dish and also get to try all the great food that our friends make. This year I’m making Party Perfect Spinach & Artichoke Dip. 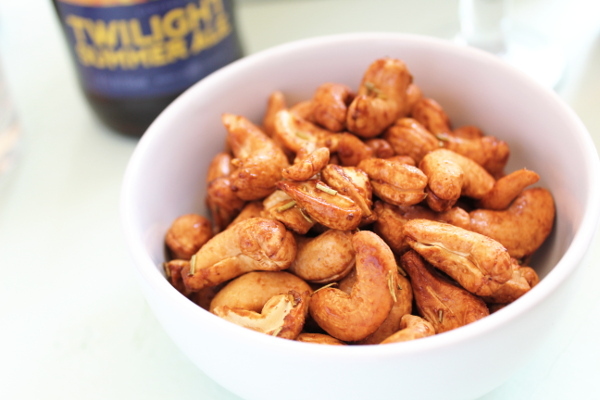 It’s a dish that I see on almost every brew pub menu so it’s a great appetizer for this party. Let’s get cooking. Or stirring, because it’s that simple. Cook the spinach to package directions and make sure it’s strained. 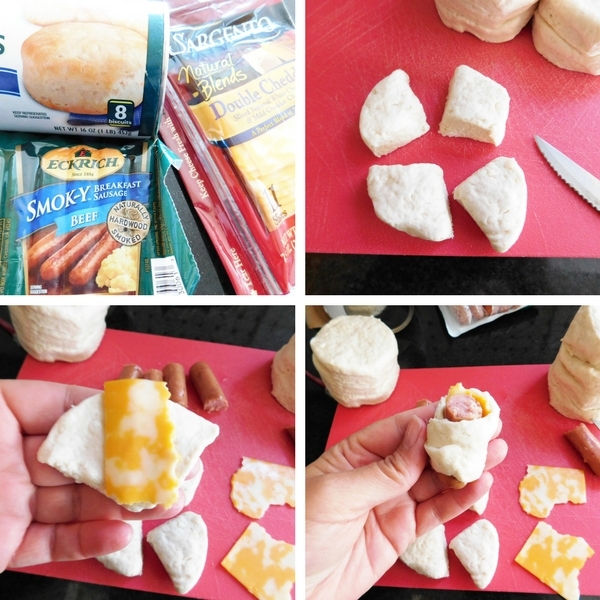 Mix all other ingredients together up until the shredded cheese. Split half into the mixture. Put dip into an oven proof dish. Top with remaining cheese. 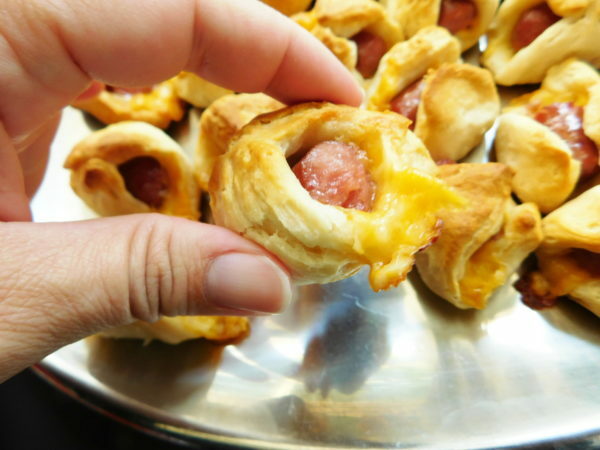 Bake at 375 degrees for 15-18 minutes or until cheese is melted. Like I said, party perfect! 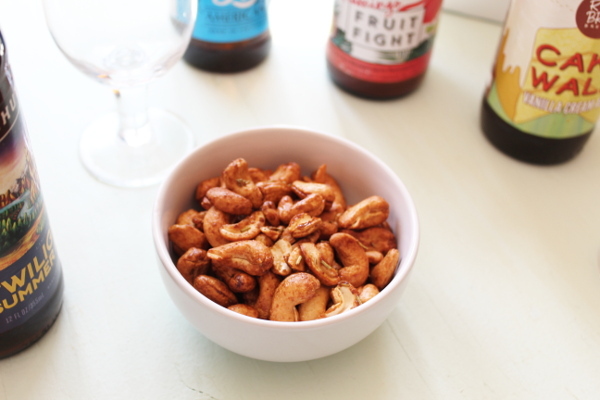 For the ultimate craft beer party a tasting set is key. It gives guests a unique way to experience craft beer. Each glass contains a tasting marker for what beer goes best with what glass. These also make spectacular Christmas gifts for the Craft Beer Lover in your life. Since we are having a craft beer party I thought I would throw out the usual BYOB for this party and call it the ‘Sixer Mixer’. Bring a six pack of beer for all to share. Some like IPA’s, some like Hefeweizen. Some like Pilsners, some like Stouts. Beer has a unique talent of finding just the right one for you. Plus this beer sharing goes perfectly with the fun game that we’re playing, Brew Haha! Can you get creative enough to beat your friends? And finally what is a party without music? Hook up the Friday Afternoon Speaker and crank up the jams. Crack your beer open, tip it over then put the phone in the now available ‘holder’. I highly suggest queuing up some Yelawolf. He is backed up by a Michigan native, maybe you’ve heard of him, Eminem! If you have someone on your gift list that loves music and beer, this would make a great gift. Love what I showed you here for the party? Visit Uncommon Goods for more gift ideas! From our home in the Bottom Left of the Mitten to yours ~ Party On & Happy Holidays! I received items in this post complimentary from Uncommon Goods. All opinions stated in this post are my own. Please read my Discloser Policy for further information. Creamy party dip loaded with spinach, zesty artichoke hearts and crunchy water chestnuts. Baked to bubbly perfection. Serve at your next party! Combine all ingredients through the shredded Italian cheese. Please 1/2 into the dip. Place dip into an oven proof dish. Top with remaining cheese. Bake at 375 degrees for 15-18 minutes or until cheese is melted. Serve with crackers, bread, or pita crisps. Just don't double dip! Enjoy. 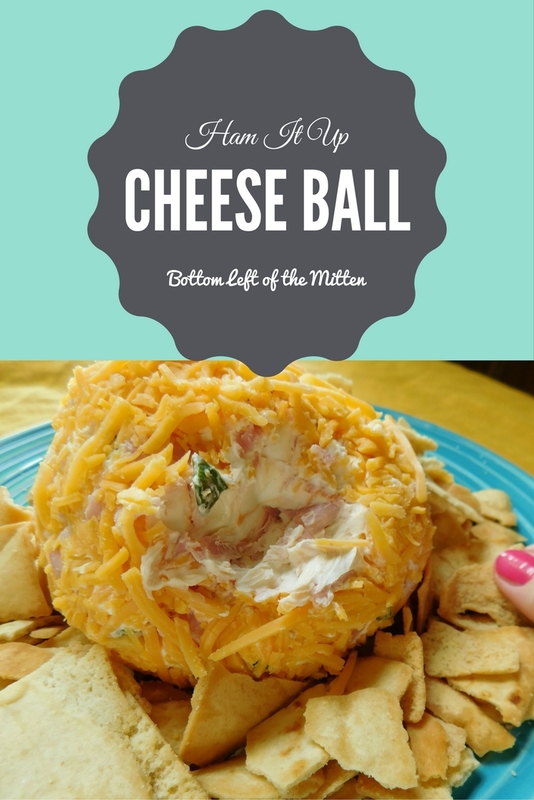 This Ham It Up Cheese Ball is a quick and easy appetizer recipe. 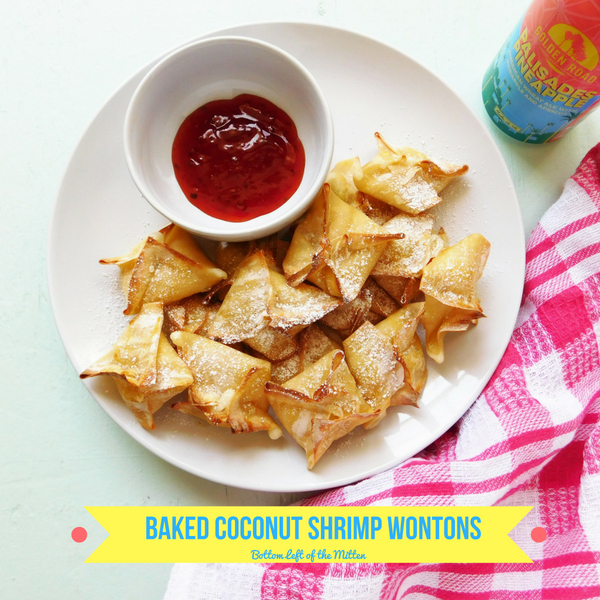 Serve up with chips or crackers and you are ready to party! This week for Mitten Movie Night I’m shaking things up a bit! No beer pairing. 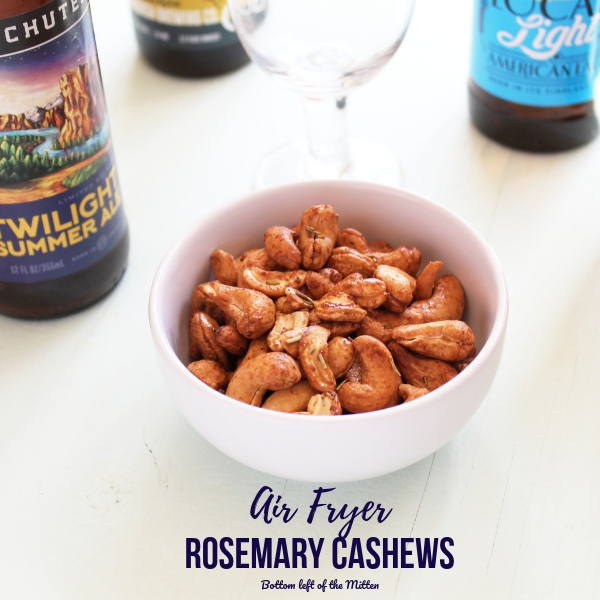 Instead, I am sharing a quick appetizer that can be made for all the fun parties and tailgates that are going on for Fall. Just a few ingredients and you’ve got a creamy, cheesy, hammy cheese ball recipe. Usually, Friday night is the night hubby and I relax. Watch a movie, grab a good beer after eating a great dinner. But tonight is different because I have another date…with my 10-year-old! We are heading to see author Johnathan Rand at the local Middle School. On a trip 3 years ago to Mackinac Island we found his Michigan Chillers books so we purchased a few. Since then Big A’s collection has grown quite extensively to include most of the American Chillers as well. 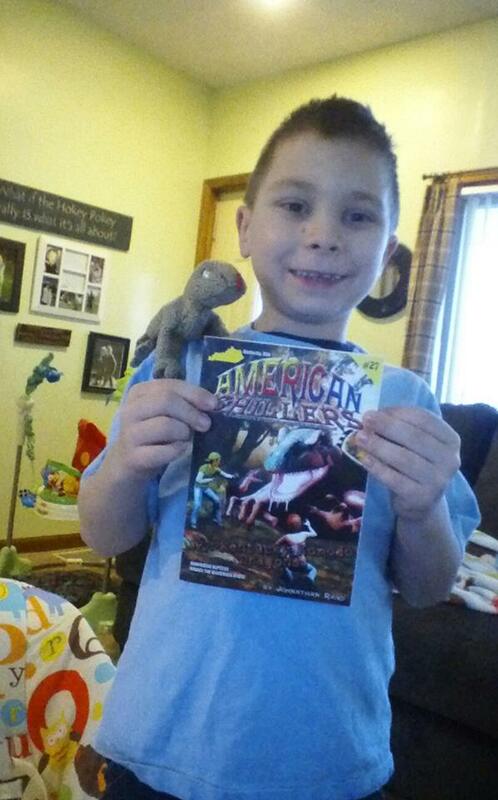 Here he is a few years ago for ‘Dress Like A Book Character Day’ in honor of Kentucky Komodo Dragons. It was exciting when I was reading our local newspaper and found out he was coming right here to our little town! We may be small but we have a great Chamber of Commerce, the Dogwood Fine Arts which is putting this together as well as Southwestern Michigan College who put on plays that just make my jaw drop. It’s a great place to live in the Bottom Left of the Mitten. So he and I are going to head there while Dad & Little A stay home. 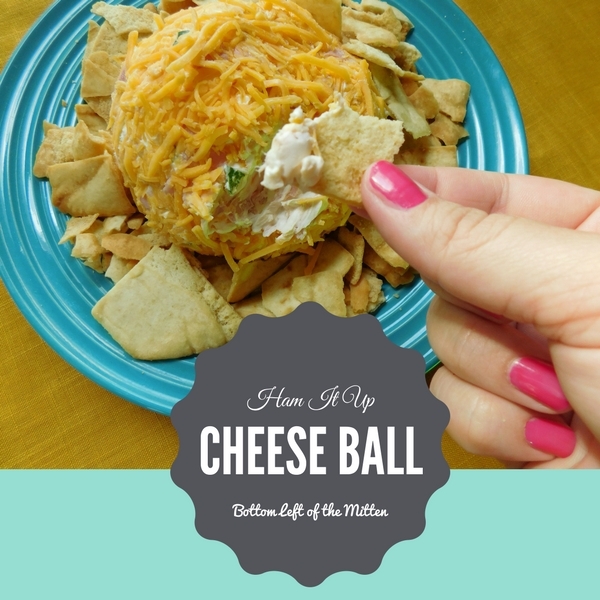 Serve with some pita chips and this cheese ball is party perfect! 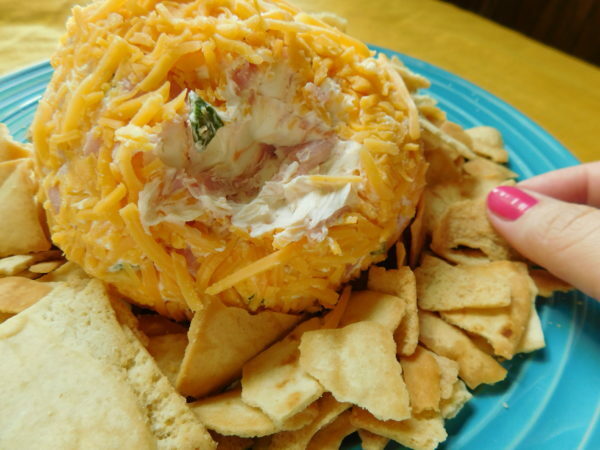 Just a few ingredients and you've got a creamy, cheesy, Ham It Up Cheese Ball that you can serve with chips or crackers. Party perfection! Chop green onions and ham into small pieces so that you get a little in each bite. Add both packages of cream cheese to a bowl. Then add seasoning salt and Worcestershire Sauce. Stir. Add green onions and ham. Finish stirring until all ingredients combined. Add 1 cup of combined cheeses. Stir until a ball is formed. On a separate plate put the additional 1/2 cup of cheese. Roll the ball into the cheese. When all cheese has stuck transfer to another plate. 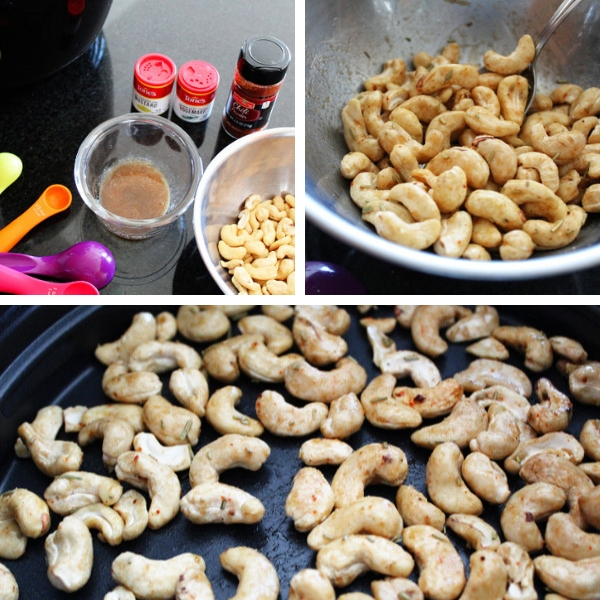 Serve with Pita Chips or Crackers. Enjoy! 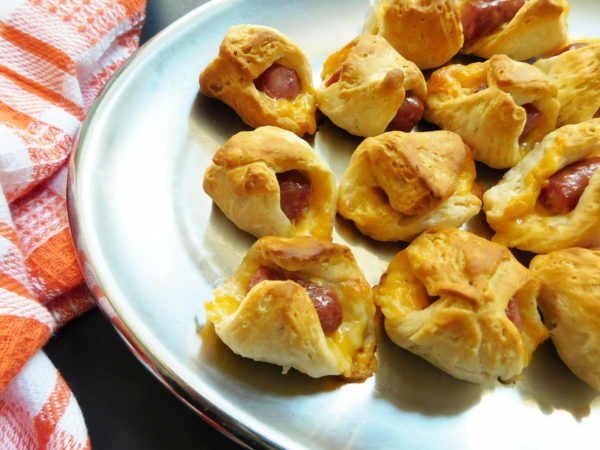 Need a quick appetizer for a get-together or cookout? 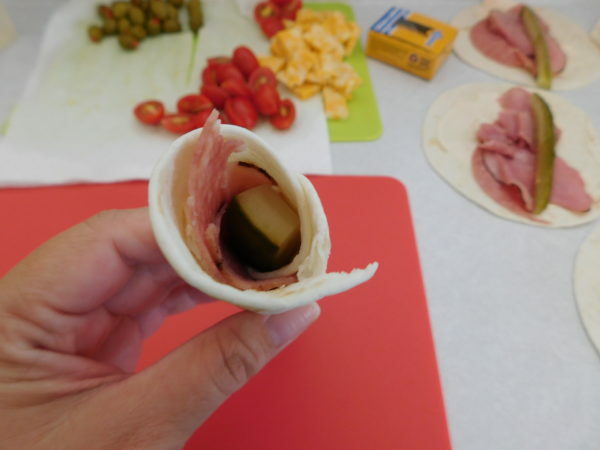 Ham and Salami Roll-ups have soft flour tortillas wrapped up with ham, salami, cream cheese, and pickle. These will disappear in no time! I’m going to come right out and say something that might make me unpopular. Summer is coming to an end and I am very happy about it. I know this kind of talk is shunned, especially in a state like Michigan, but I can’t help it. Fall is the best! Tailgating, cookouts and enjoying the last few months of warm weather. I am into it! First, make sure that your cream cheese has softened some. If you try and mix the spices it will be too hard if not and then also you can tar the tortilla when spreading it. I left mine out for about 30 minutes. Once softened add your chili powder, garlic & seasoning salt to it. Mix well. Next, cut up all your cheese and tomatoes. 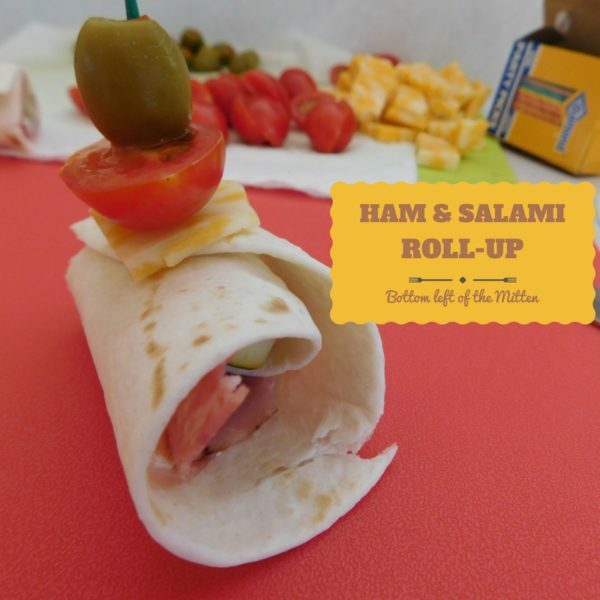 You will get 3 roll-ups from each tortilla so make sure you have 36 pieces of cheese, tomatoes, and olives for the garnish. All that’s left to do is assemble. Lay out all of my tortillas and then layer from there. 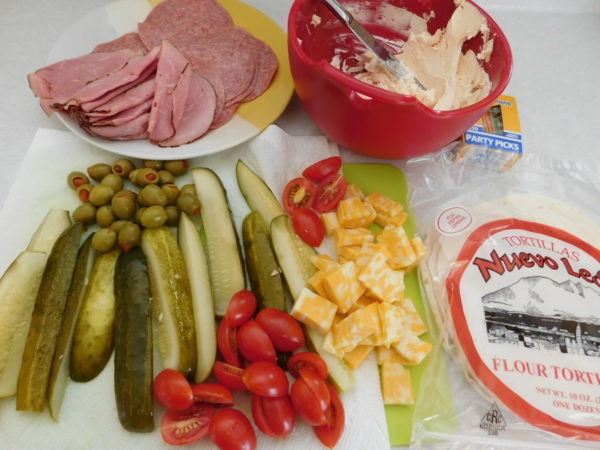 Tortilla layered with cream cheese mixture, add salami, add ham, add pickle and roll. Now you will add 3 toothpicks to secure. Cut in even sections. Add a piece of cheese, tomato, and olive for garnish. Originally published in October of 2016. Updated post in March of 2019. Thank you so much to Coleen from The Redhead Baker for hosting this weeks Sunday Supper. 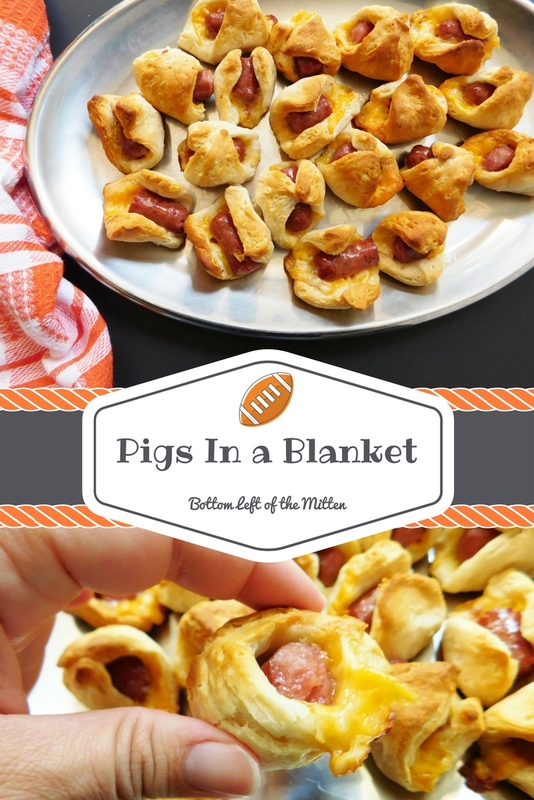 Get your hungry game watchers filled up fast with these other Easy Football Food Ideas……. 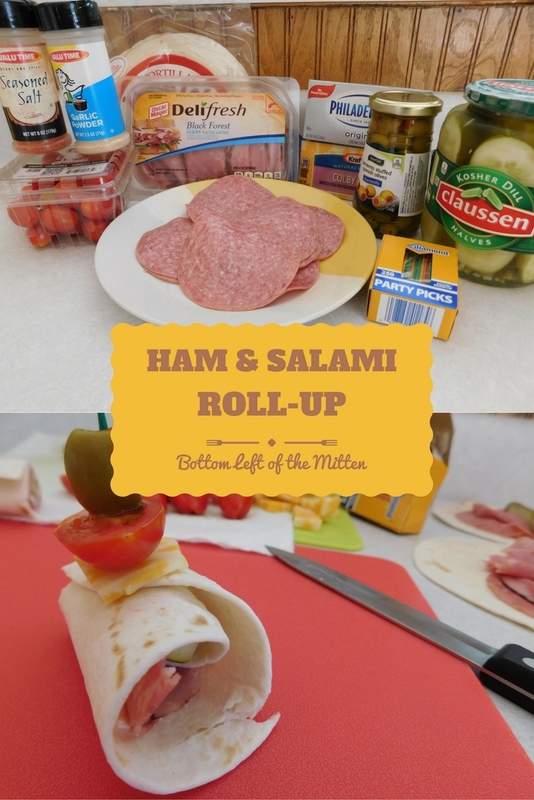 Ham and Salami Roll-ups have tortillas spread with spicy cream cheese then layered with ham and salami. 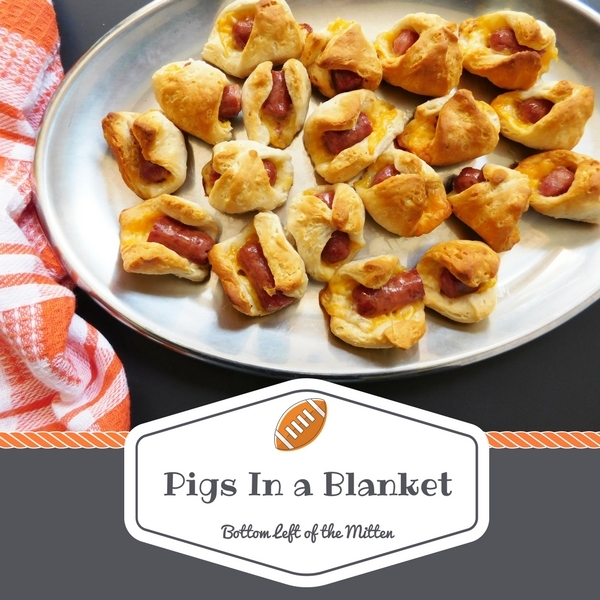 A quick appetizer for any party or game day! Once softened add your chili powder, garlic & seasoning salt to it. Mix well. Cut up all your cheese and tomatoes. You will get 3 roll-ups from each tortilla so make sure you have 36 pieces of cheese, tomatoes and olives for the garnish. Lay out tortillas and then layer from there. 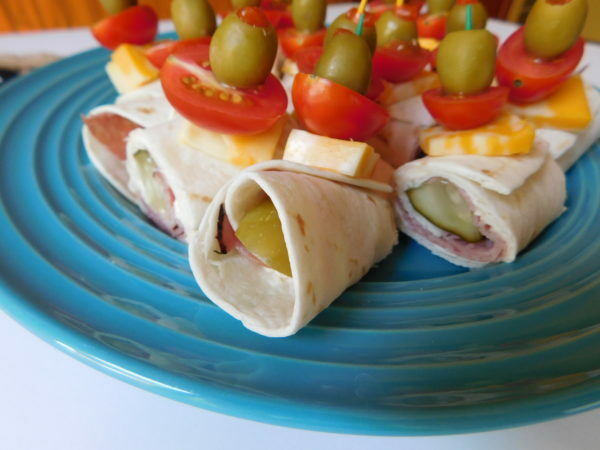 Tortilla layered with cream cheese mixture, add salami, add ham, add pickle and roll. Now you will add 3 toothpicks to secure. Cut in even sections. Add piece of cheese, tomato and olive for garnish.